Russia is, what its situation in Europe is concerned, a stranger in our midst. It’s part European, it’s part Asian, but above all it’s Russia. It is one of those countries that together with the United States, China and the United Kingdom dominate international politics, economy and sports. Russian consumers generally distrust the safety of online transactions and, in certain cases, the honesty of online retailers. That’s why cash on delivery is the main payment method (around 80%), as far as physical goods are concerned. Bank cards aren’t used very often for purchases even in brick and mortar stores, but online it also represents a low part of total online consumer spending. The most popular local electronic currencies are Yandex Money, Webmoney and the QIWI Wallet. PayPal began serving domestic transactions only in late 2013. 93% of all domestic purchases made online are cash-on-delivery, according to SPSR Express. In 2017, Statista asked Russian shoppers how they have conducted online payments in the last twelve months. ‘Online payment’ was answered by 59 percent of respondents, while credit card (39 percent), cash in advance (35 percent) and paying by invoice (also 35 percent) are other popular online payment methods in Russia. 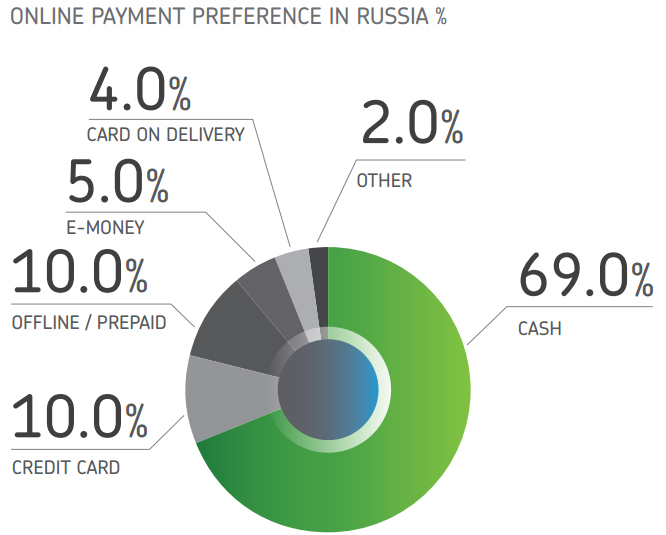 Online payment methods in Russia, according to Payvision. According to Moscow’s Data Insight, Russia has a 10.4 billion euro ecommerce market in 2013, up 27 percent from 2012. This represented a mere 2% of the total retail market. Morgan Stanley forecasts the Russian ecommerce sector to grow 35% annually to 2015, reaching 4.5% of total retail sales. According to East-West Digital News, the Russian ecommerce sector could grow to 35 billion to 50 billion euros by the end of this decade and exceed 75 billion euros in ten years. 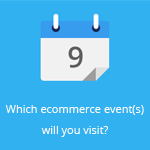 There are always different ways to calculate the total ecommerce value of a country: some organizations don’t count travel expenses, while others also include online gambling or tourism. That’s why Ecommerce Foundation has released totally different numbers. It states the ecommerce in Russia was worth 20.5 billion euros in 2015 and is predicted to reach 21.6 billion euros in 2016. The biggest player in the Russian market is Ulmart.ru, with a diversified assortment from electronics to items for the home and garden. Its 2015 turnover reached an estimated 510 billion euros. Among the other important players are Ozon, which can be seen as a Russian equivalent of Amazon, KupiVIP (a copycat of Venteprivee.com), group buying platform Biglion, platform Avito and the online properties of the German Otto Group. Data Insight and Ruward published a top 100 of online stores in Russia. February 25, 2019Russian online marketplace Joom, which features low-priced products from China, is increasingly betting on French brands. After helping French merchants to sell their products in Europe, Joom wants to take things further and target merchants in other European countries as well. November 27, 2018Russian tech platform Yandex has launched two new services aimed at ecommerce. It now provides an online marketplace, called Beru, and offers Bringly: an ecommerce platform that is dedicated to enhancing cross-border shopping for consumers in Russia. Read all our articles about ecommerce in Russia. Last update: November 2018. Thanks to: East-West Digital News.